Originally built in 1758, Hôtel de Crillon enjoys an unrivaled position overlooking the Place de la Concorde. The legendary palace offers a refined and illustrious history, encapsulating the very best France has to offer. With its perfectly proportioned, Neoclassical façade and architecture, the hotel was designed to captivate. It has dazzled generations of visitors and played host to some of history’s greatest events. The building has stood through the reigns of two French kings, the French Revolution, the rise and fall of the Napoleonic Empire and the birth of the League of Nations. In 1758, King Louis XV commissioned the greatest architect of his day, Jacques-Ange Gabriel, to build twin structures overlooking the Place de la Concorde. The result was a masterpiece of 18th-century architecture. Behind one of the facades rose a sumptuous private residence decorated by the era’s finest artists and craftsmen. 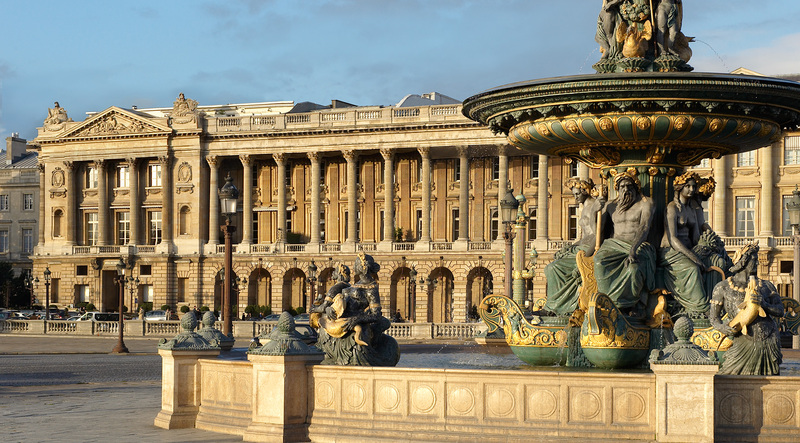 Such are the origins of the Hôtel de Crillon, created to host the world’s great ambassadors. Long owned by the illustrious family of the Counts of Crillon, this private mansion was transformed into a luxury palace hotel in 1909 under the impulse of architect Walter-André Destailleur. In March 2013, Hôtel de Crillon closed its doors to embark on a major renovation to further enhance the majesty and elegance of this exceptional establishment, while conserving the spirit of its prestigious 18th-century edifice. Inspired by its glorious history, respectful of its traditions and faithful to its character, the restoration adds a contemporary polish to the hotel. Under the guidance of renowned architect Richard Martinet, the artistic director Aline d’Amman and three Paris-based decorators—Chahan Minassian, Cyril Vergniol and Tristan Auer—have created a rich tapestry of sophisticated interiors. The transformed Hôtel de Crillon offers incomparable luxury with eclectic, art-driven spaces that culminate in an emotional crescendo… elegantly expressing the spirit of Paris.